If you are a Mom, you have faced fear. Even the fiercest of us unravel when a new life is placed in our arms and the reality of his or her utter dependence upon us sinks in. In that moment we want nothing more than to be bravery-in-the-flesh for this precious life God has given us. How to be brave when we already fear taking our eyes away from the rise and fall of our baby’s chest? And when we are terrified at the mere thought of leaving this little one in the backseat while we sit in the front? How will we be brave in the face of the million decisions marking the paths of our children’s lives? But out of the fierceness of our love, we commit to bravery. With determination, we go forward just one step at a time. And the exhaustion of it all. Yes, the exhaustion. Have you ever noticed that exhaustion is a welcoming mat to fear? The more we allow exhaustion to take over our lives, the more we allow fear to roam in our hearts. It creeps in unnoticed and begins weaving an intricate web throughout our thought life. So what do we do? Exhaustion is often an unavoidable part of motherhood and parenting out of fear isn’t what we want nor what our children need. 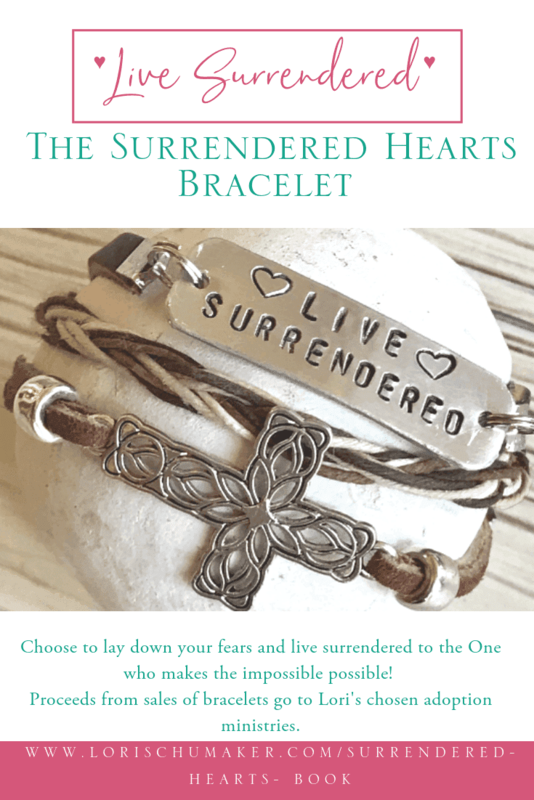 So, how does a weary Mom find bravery? 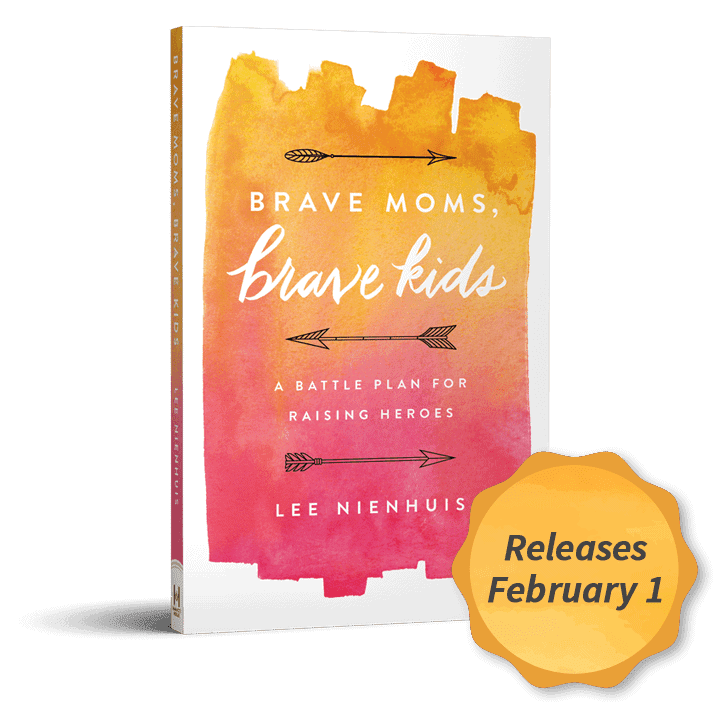 I have the privilege of being on Lee Niehaus’s launch team for her book Brave Moms, Brave Kids: A Battle Plan for Raising Heroes (Launching February 1, 2018). Friends, this is a book with insight, encouragement, and hands on strategies as to the why’s and how’s of doing this brave Momma thing. It’s a book you need on your nightstand. One you need to read from cover to cover because it not only teaches, encourages, and inspires, but it points you right back to the source of all of our fear fighting. “God is able to make all grace abound to you, so that in all things at all times, having all that you need, you will abound in every good work” (2 Corinthians 9:8 NIV, emphasis Lee Nienhuis). going along with the world’s standards? The asking and answering wasn’t pleasant. Admitting areas of weakness is often so difficult, especially when it’s an area where we think we have been nailing it! But that’s exactly where I found myself as I worked my way through Brave Moms, Brave Kids. Humbling for sure! 2. Once we humble ourselves, ask the hard questions, and call fear out for what it is and what it is doing, we can then fight it. I love the battle plan Lee gives in Brave Moms, Brave Kids. Her book is broken into three parts. The second part is where we find the battle plan with the acronym BRAVE. What better way to remember the steps, right? Friends, this framework is rock solid! It is grounded in Biblical truth and without these 5 steps, we just won’t live fearless lives. And we won’t pass on a legacy of bravery to our children. Friends, I have missed you during my blogging break! But while I was away, I did a great deal of thinking and praying. My word for 2018 is replenish. Although 2017 was filled with much good, it of course was not without the difficult. By the end, I knew I’d emptied my reserves and forgotten how to follow God’s call and rely on His strength. I said too many good yes’s – they just weren’t my best yes’s. So this year I am replenishing. And in order to do that replenishing, I needed to make some changes. 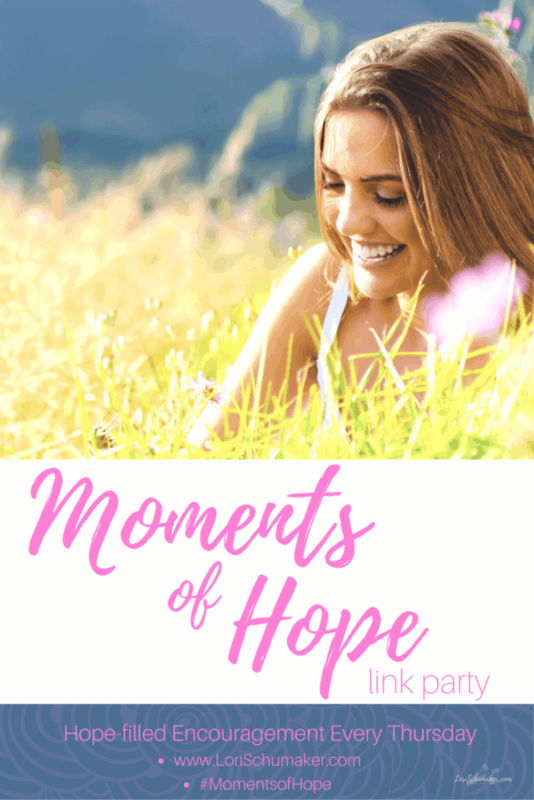 The first one starts right here with the #MomentsofHope Link-Up. The #MomentsofHope Link-Up is moving to Thursday! Since it doesn’t make a lot of sense to do two link-ups in one week, we will have this one here today and then, starting on February 8th, #MomentsofHope will move to Thursdays. Thank you for sharing hope alongside me, friends. Whether it is through a comment, an email, or linking up your words of hope, you share hope with a world in need. And while you do so, you fill my heart and encourage me in great big ways. This book sounds amazing! What parent doesn’t need a battle plan for the future heroes of faith?! Such an important area in this fear filled world of parenting. Thank you for sharing this book! We all need a little break sometimes, but can I just tell you how happy I am that you are back! I loved your post and think it’s so true that exhaustion is a welcome mat to fear. The book sounds great, and I love the BRAVE acronym! 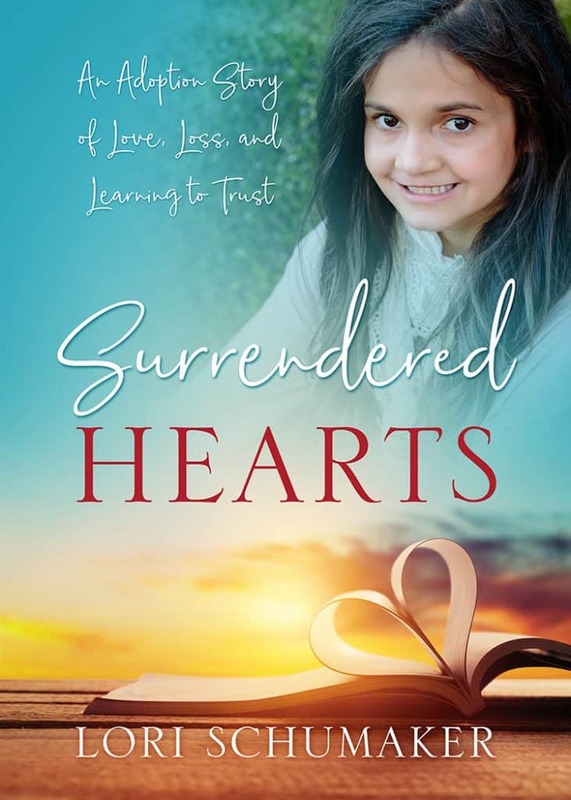 I know this is a book you would love, Val, because you are such a warrior against fear who gives hope to so many! I missed being here and missed all my people ♥ I’m glad you missed me back! lol! Really struck by the subtitle for this book: A Battle Plan. Amen, Michele! It’s so good to see you here and read your comments. Your words always provide nuggets of inspiration and thought! So many good points to pray about here, Lori. This book sounds spot on (for me)! Thanks so much for sharing about it. It is beautiful too. It is such a great book. I’m thrilled to have the opportunity to share it! Hugs, smiles, and blessings to you, my friend!!! Lori, I am SO glad that you are back! I’ve missed reading your always-encouraging posts! Replenish is a GREAT word! I’m praying God will replenish you abundantly during this season, as you continue in the graceful dance of rest and ministry. And thanks for the book recommendation. It looks like a good one! Awww … thank you, Rachel! Your kind words are such a gift! And thank you so much for the prayers. God bless you!!! Welcome back. I’ve missed you. Exhaustion goes with motherhood but it can be overcome. I know! welcome back Lori. You have been missed. May God bless you in all your endeavors in the New Year. Thank you, Horace! It is good to be back! I missed connecting with others here in this place! And may God also bless you!! Wonderful words of encouragement today, Lori! Thanks so much, Melanie! The feeling is mutual!!!! It is my joy to do so, Noelle! God bless you! So glad to have you back, Lori! How did you know I needed a special blend of bravery mixed with hope today? 🙂 Blessings, my friend! It’s so good to connect again with you, Carlie! So thankful God lead you here today ♥ He knows just what we need and turns up at the very BEST of times, doesn’t He?I hope all is well. Sending you hugs and love! Thanks for joining me, Sherry! God’s blessings!!! What a wonderful book. Funny I am reading it right now and I am exhausted. 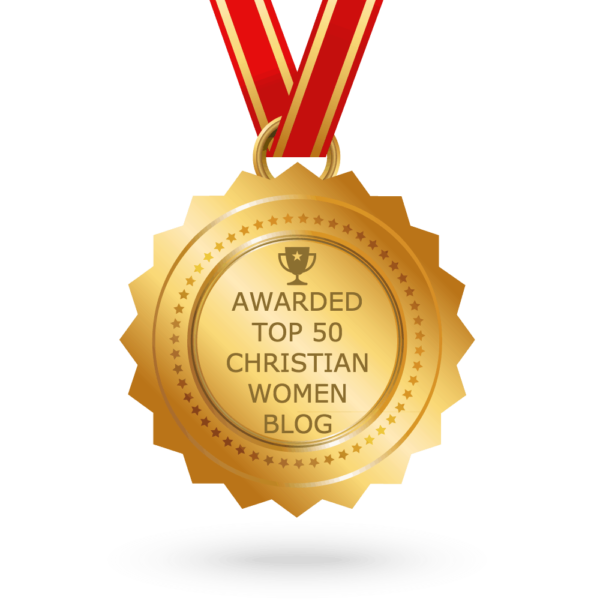 Exhausted trying to figure out what is God’s best for me in my parenting of adult children. Not to mention we have a new puppy and she is a fireball. Love having you back.